Yesterday we had guests for lunch. Lisbet and I were bubbling over with ideas. We wanted the dishes to be simple and summery but we just couldn't decide which to include and what to leave out. So we just did it all! 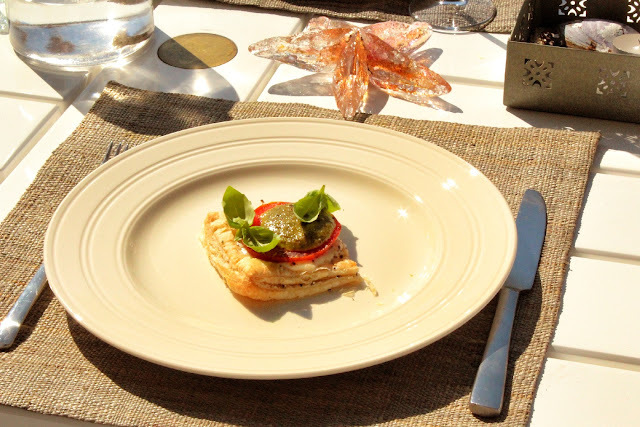 We started with a tomato, mozzarella and basil pesto tart. 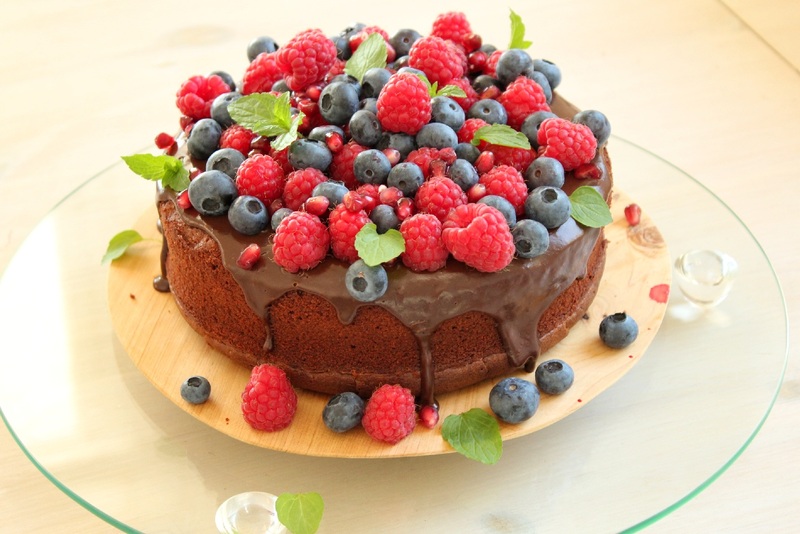 For the recipe, click here. 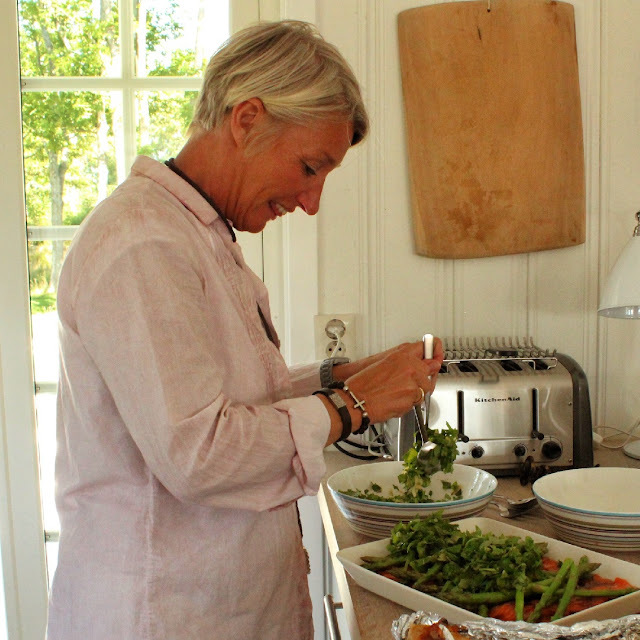 For the second course, Lisbet made a dish she is famous for - an Asian style salmon salad. I have recorded the recipe below and can't wait to make it myself. It was simply sensational and the guests raved about it! 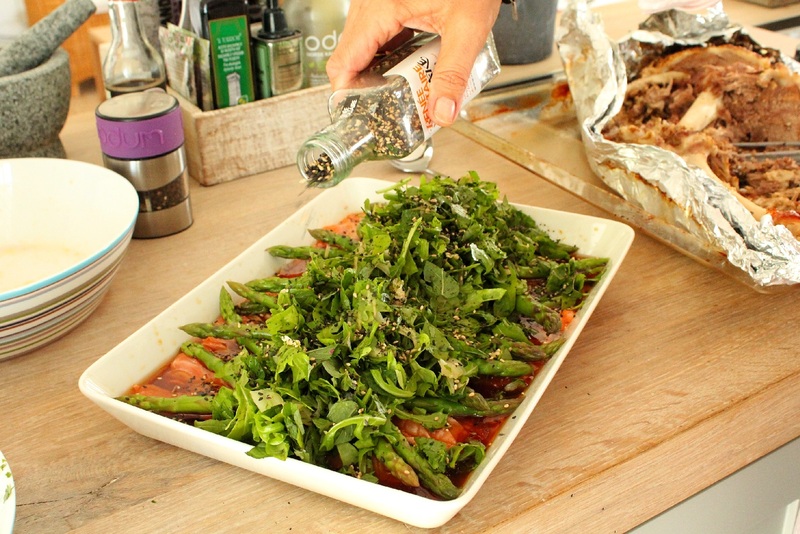 The massive pile of chopped coriander, mint and rocket going on top of the salmon and asparagus. The final touch - black and white sesame seeds from Renee Voltaire. The final product, ready to get flattened in a matter of minutes to sighs of delight. 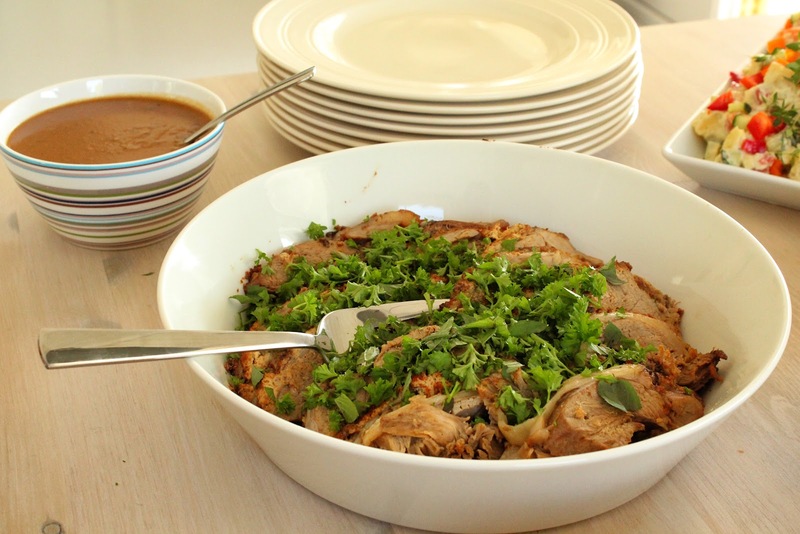 In order to make this dish you need to plan ahead and do all the preparations accordingly. 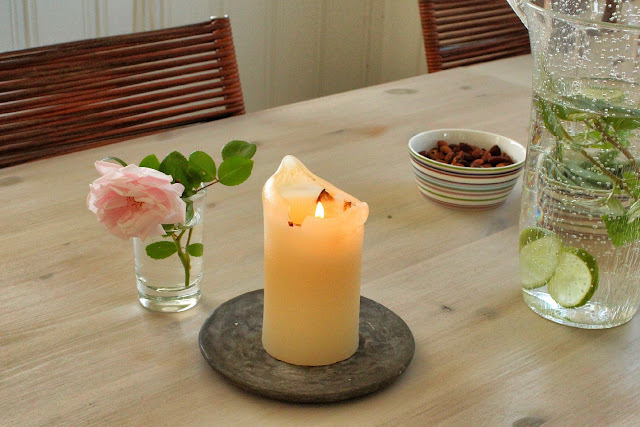 Then it will be easy to serve and enjoy with your guests. 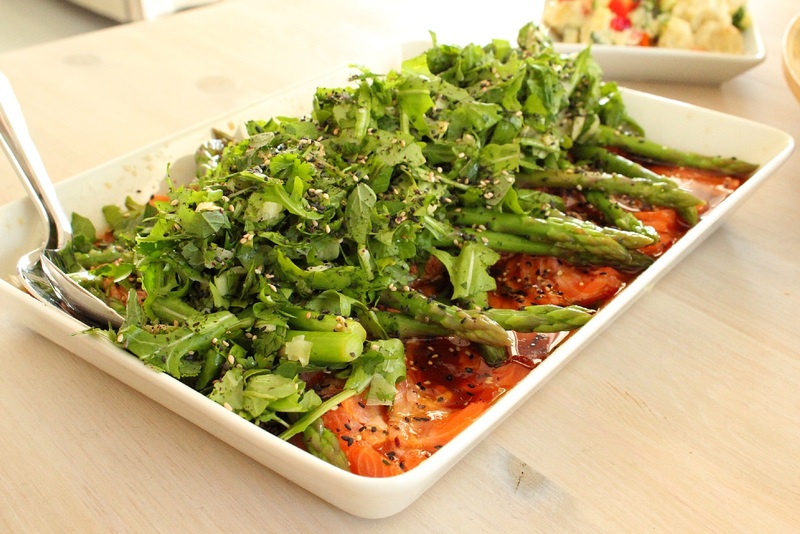 Freeze your salmon in order to make it easier to cut. You may need to let it to thaw a bit if it is frozen too hard. Cut it into very thin slices and lay these slightly overlapping on a platter and allow this to defrost completely. Cover the asparagus spears with boiling water for the kettle for 5 minutes, then drain and rinse with cold water, setting them aside for later. Drizzle them with a little olive oil and some salt to taste. Mix up the dressing ingredients – the lime juice, soya, wasabi and ginger juice (check the flavours and adjust where necessary) and set aside for later. Wash, drain and roughly chop up the herbs. Add the chopped ginger and set aside for later. When you are ready to serve, heat the sesame and olive oil until smoking hot. Drizzle the hot oil over the salmon, pour over the dressing. Scatter the asparagus spears and pile the herbs over the top. Garnish with sesame seeds and serve immediately. 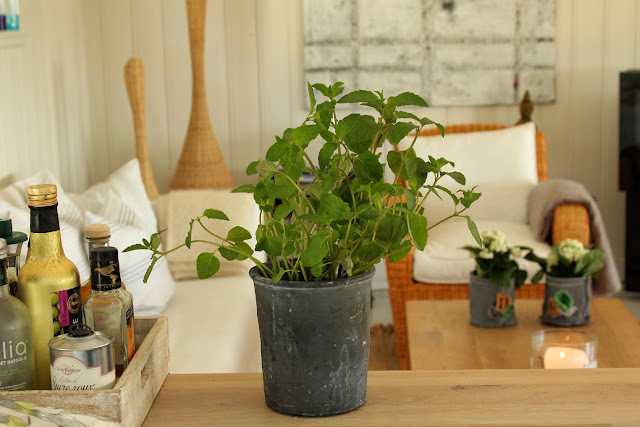 A pot of fresh mint adding a touch of colour and decoration to the kitchen counter. My avo and boiled egg Caesar salad waiting for the final touches of fresh chives and Caesar dressing. I forgot the Parmesan shaving but it was still delicious. 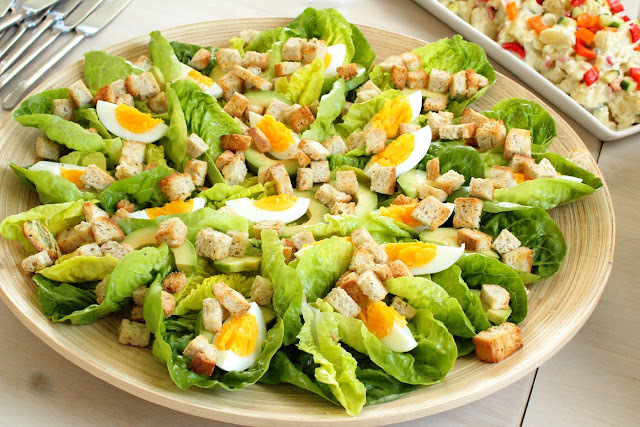 For my Caesar salad recipe, click here. My potato salad which I am busy enjoying the left overs of while I type. Yum. Even though the recipe is pretty much the same as always, it tastes totally different as the ingredients I have used are different. The vinegar I used is Oliviers and co. and infused with honey. The stock is Renee Voltaire who's products I am crazy about. I also added a touch of truffle salt to the stock which added a soft earthiness to the taste. The pesto I used is alla genovese which is far cheesier and creamier than the one we get in South Africa. That is the great thing about traveling, it makes you see the world in new and exiting ways. 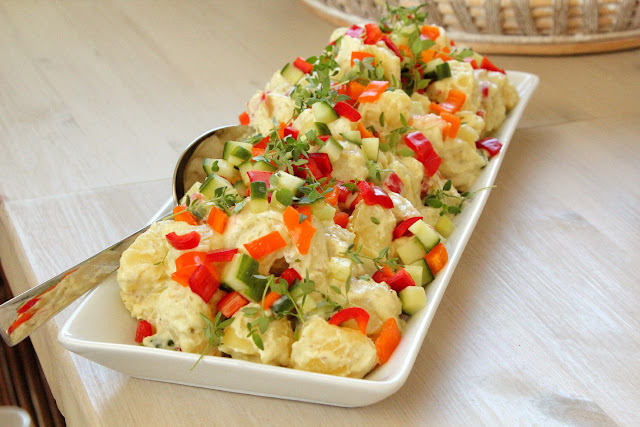 For my potato salad recipe, click here. The Lamb we made for the second time, as Lisbet was craving it. It also gave me the chance to write down the recipe and take a few more pictures. I will blog about it in more detail soon. Just need to find the time to get it all down in black and white first. We ended with my good old favorite, Devils food cake. I don't think it turned out that well. I had to substitute baking powder with the bicarb in the original recipe and I it just wasn't as light and fluffy as it usually is. But everyone still loved it and I just love how the berries and mint looked all over it. For the original recipe, click here. Such a gorgeous day, still basking in the after glow.